Throughout my entire life, I've always had a second job, and all of them have included direct interaction with other people. And I thoroughly enjoy human interaction. Not only is it additional income, but it also provides me an ongoing opportunity to observe and understand human nature. This is an extrovert's paradise. Being a great Airbnb host is an art form. Not only do you need to vet every person who will share your home, but you should also be hospitable by greeting them and telling them about the best local places to go. That being said, make sure you understand when to give a guest their space, as an overzealous Airbnb host can prompt bad ratings. Tour guides not only get to meet out-of-towners, but also get to show their personality while talking about fascinating local subjects. Your town might have a ghost tour, historical tour, bike tour, or walking tour that you could check out. It's a fun job and stress-free once you know what you're talking about. Becoming a certified yoga instructor will not only give you peace of mind, but will also give you a chance to help others become healthier or more peaceful. I have some friends who are yoga instructors and create their own schedules, essentially. You will need to guide a room full of people into poses that might be foreign to them — so excellent communication skills are a must. The upfront fee to become a yoga instructor can be pricey, but once you do, the benefits can far outweigh the cost. Much like Airbnb, being a good Uber driver is contingent on your ability to deal with people. Having bottles of water in the car, greeting your customers with a smile, and reading the room on how much you should be talking are all essential elements of a good Uber rating. We had an Uber driver in New Orleans that made us late for a reservation because she took the long way to show us famous houses. She was great and thoughtful, but we were in a hurry, so make sure you keep that in mind if you start driving for hire. Having a day job that ends at 5 p.m. tends to coincide with school schedules, so if you have some time on your hands at night and are especially good at a certain subject, consider tutoring. You could tutor children or adults in GED prep, math, reading, science, and more. Not only will this be rewarding for you, but other people will benefit from what you are offering, and you will using your knowledge to teach someone else very important skills or information. Research established programs or reach out to schools to see what might be available. If you love the outdoors, being an outdoor guide might be right up your alley. I live in Chattanooga, Tennessee, where we're known for our outdoor activities. From hiking to rock climbing to kayaking — there's something for everyone. You could be a guide on hunting trips, trail tours, or boat excursions. If you're especially good at an outdoor sport and want to show and guide others on how to do it, consider looking into outdoor programs in your area. Don't forget there might be some upfront costs such as CPR training or first aid certification. Since the invention of Instagram, everyone thinks they're a photographer. But if you have real photography skills, consider being a wedding or family photographer on the side. You can make a lot of money if you're good, and the more, the better. You might think that you're mostly hiding behind a camera, but this job requires supreme social skills. You'll be capturing people's most important life moments, and you want them to be happy with the results. A nice camera and editing chops come with the job, so only those qualified or with a real passion for photography should consider this choice. I love planning events. I love the stress and exhilaration of doing a good job, and planning and running events is the perfect avenue for that. If you are organized, thoughtful, and can deal with the attitude of whomever you are planning the event for, you should consider doing this. It takes patience, tact, a little bit of grace, and a lot of talking, but it's definitely worth it. As the U.S. population continues to become more and more diverse, every town across America is in need of great ESL teachers. You do have to have a bachelor's degree typically for this program, and there are upfront costs, but every single ESL teacher I know absolutely loves it! Plus, you'll be constantly practicing your communication skills as an ESL teacher, which will make you a better communicator in all situations. The sky's the limit on this one. You could work at a coffee shop, bar, music venue, theater, or anything else that might be open for a 5-9 position. There are plenty of options, so choose what you love. That way you have an authentic interest in what you'll be discussing with customers. Theaters and music venues often give discounts on shows, but it's probably not a good idea to ask that in the interview. 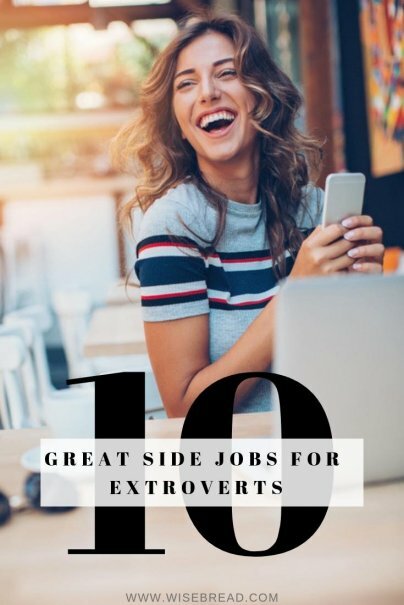 What other second jobs would be perfect for an extrovert? Share with us in the comments! Well extrovert people are the person who like to communicate and have no issues on communication like introverts. Great jobs. They are perfect for extrovert who can be well developed in communication.